A future forensic anthropologist, Andreana recently earned a highly competive summer internship, funded by the National Science Foundation, at the Smithsonian Institution. Read more about Andreana here. Sanchez, a double major in Ecosystem Science and Policy and Anthropology, has been conducting research on the complex ecological linkages between people and the environment in cities. In high school, Chris began his research endeavors in a lab at Florida International University in the Florida Coastal Everglades Longterm Ecological Research (FCE LTER) program. His work associating fossils of novel organisms with hydrolic conditions in the Everglades led to a greater understanding of the environmental history of the FCE LTER research sites. Chris’ success in this project earned him four state, national and international Science Fair awards and the honor of having a minor planet named after him. He was also able to publish his research as a high school student in the Journal of Paleolimnology. His mentor on the project, Dr. Evelyn Gaiser, describes Chris as having a “level of tenacity rare even to established scientists.” Chris spent this past summer in Phoenix at Arizona State University with NSF support through the Central Arizona-Phoenix LTER Program studying the hydrology of a novel wastewater treatment wetland outside of Phoenix. Professor Daniel L. Childers, director of the program in Phoenix, says of Chris, "He is focused, ambitious, and very passionate in his research and the scientific endeavor, particularly in the fields of wetland ecology, urban systems research, and sustainability science." Mapping ancient cities, puzzling over shards of pottery, and excavating the floor of a home that belonged to an elite Mayan family – that's how Julie Wesp spent her summer. 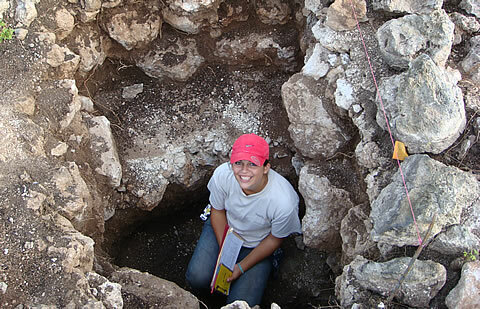 The Latin American studies and anthropology double major used her "Beyond the Book" award to travel to Xuenkal, a relatively unknown Mayan archaeo- logical site in the Yucatán. "It's not something you can do in the classroom," said Wesp, who spent two months helping associate professor of anthropology Traci Ardren with her project. Dr. Lowry is now a faculty member in the Anthropology Department at George Mason University. Justin was recently awarded the Franz Boas Global Citizenship Award by the Center for Public Anthropology. Read more about his work here. Derek is a conservation field technologists. Read more about his work here. Mireya is now an explorer and primatologist. Read more about here work on NPR.